Between technology and our assortment of electronic devices — from phones and laptops to tablets and TV — being completely disconnected these days just doesn’t happen. The familiar scene of everyone being tuned into their email while waiting in line for lunch or for their named to be called at the doctor’s office, to just sit and relax or even have a face-to-face conversation with the person next to you is rare these days. When was the last time you went even a couple of hours without checking your phone or the onslaught of social media sites? Going without technology can feel like you’re completely disconnected or like a limb has been amputated, but unplugging and taking an adult digital detox is needed. Take a digital detox at TreeRunner Raleigh for a couple of hours and reconnect with yourself and those around you. At our obstacle course, you can climb and escape within the Raleigh timber free from the electronic devices that you’re constantly checking! 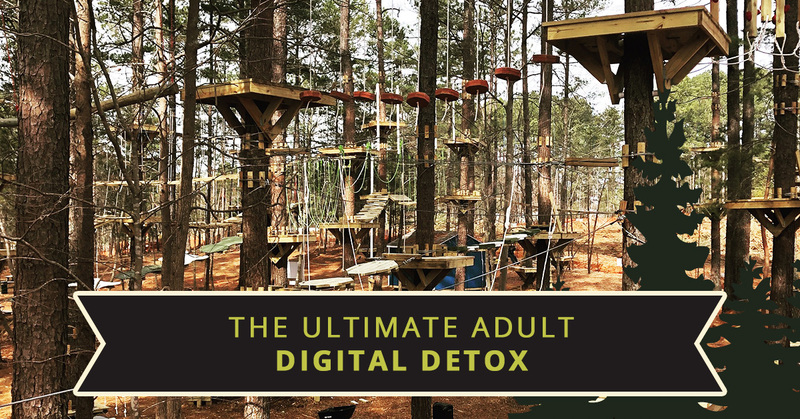 Find out more about why TreeRunner Raleigh is the place for an adult digital detox. Disconnect and reconnect with a TreeRunner obstacle course. Give yourself the power – When you’re at the beckoning call of technology, you’re always available to people — your work, family, and friends. Put the power back in your hands and even practice a little self-control with a digital detox. When you put away technology, it allows you to be in the moment and your 10 minutes of work doesn’t turn into an hour! Give your brain a break – Our brains are amazing at adaptation, but they get tired! The continuous stimulation stresses it out! Many people report a technology overload, yet continue to use technology almost exclusively in a 12 to 14 hour period. Feel refreshed and even more productive when you give your brain a break. Shut off technology and breathe fresh air while you’re enjoying the moment with a digital detox at TreeRunner Raleigh. Reclaim your time – Do you ever log out of social media, only to mindlessly log right back in? How much time do you spend consuming things on the internet? While social media and technology can be great tools, they are also huge time burglars — they rob us of our nonrenewable resource that is time. When you unplug or commit to a digital detox, you’ll realize the mass amount of time you’ll get back to do things that really matter. Get into a new fitness routine or finally learn to play guitar! TreeRunner Raleigh is a great time to start your digital detox and keep it going well throughout your week. Spawn creativity – When you unplug and give your brain a chance to just be, you’ll be surprised in how much it spawns creativity. It now has the time to meander and wander into the space that was once taken up by screens and lists to check off. Allow yourself a digital detox to reclaim power and time, give your brain a break, and spawn creativity. Find yourself in the moment and recharged at TreeRunner Raleigh. 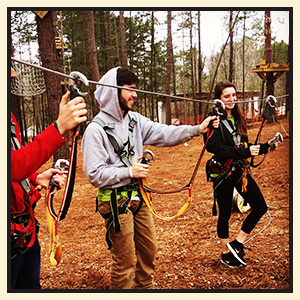 Book a treeline obstacle course today and get intentional about unplugging!